I hope all JAZZ LIVES readers are familiar with the Anachronic Jazz Band — loosely translated, that’s “going against time” — a beautifully-rehearsed and inspiring jazz ensemble that plays modern jazz standards in the styles of the Twenties and Thirties. With sincerity, accuracy, and wit they not only imagine worlds that never existed but translate those worlds into glorious music. The AJB is a joyously playful band but also an exact one; they don’t just play music in a vaguely historical style; rather they take, perhaps, a Mingus composition and reimagine it as a Luis Russell recording. They admire and they do not satirize. They began in 1976 as a nine-piece orchestra led by pianist Philippe Baudoin and multi-instrumentalist Marc Richard, made several inimitable recordings, and then the members went their separate ways — reuniting in 2013. Here ‘s my review of that CD. And their website and Facebook page. I want everyone to admire a particular AJB performance: a July 16, 1977 rendition — recorded and televised at the Nice Jazz Festival (“La Grande Parade du Jazz”) — of Thelonious Monk’s ballad ASK ME NOW. But where Monk’s original is both passionate and spiky, the AJB reimagined this lovely ballad as played by Louis Armstrong (Louis, in this case, being Patrick Artero) with equally touching solos by Daniel Huck on alto saxophone and Philippe Baudoin on piano. 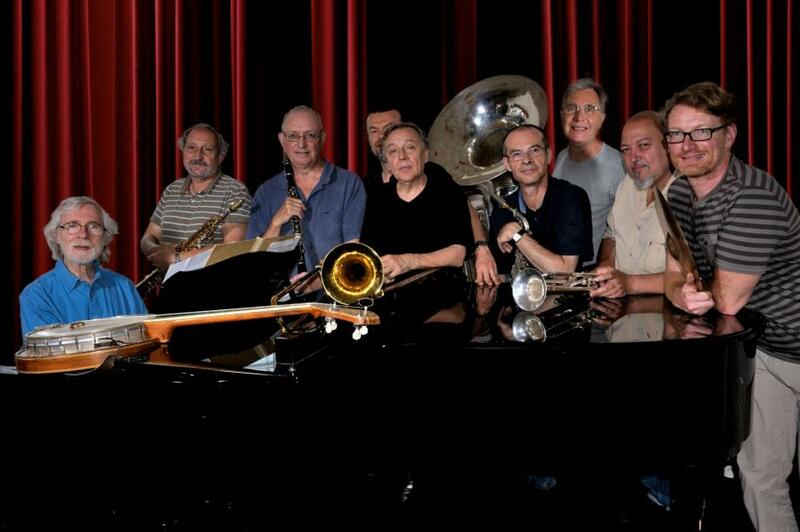 Patrick Artero, trumpet; Daniel Barda, trombone; Marc Richard, alto saxophone; André Villéger, tenor saxophone; Daniel Huck, alto saxophone; Philippe Baudoin, piano; Patrick Diaz, banjo; Gérard Gervois, brass bass; Bernard Laye, drums. Ricky Riccardi, who lives Louis in his waking hours and dreams Louis in the three or four hours he’s allowed to sleep, would tell us that Louis indeed had a Monk record in his library — and transferred it to tape, his highest tribute. Who knows that the two men didn’t cross paths in 1941 or 1942 or later? But the AJB doesn’t simply write this as a musical science-fiction story; their rendition of ASK ME NOW sends love all around: to Monk, to Louis, to anyone with ears. It gives me great pleasure to know that such things are possible. HOW FAR IS IT TO NÎMES? I need Google Maps, or maybe Mapquest, to figure out the distance. Because on the evidence of this and an earlier video clip, that French city is the place to be for Hot! Which I translate (!) as Armand Yepes, my French brother, went to O’Flaherty’s Pub on January 8, 2014, and recorded a band with some allegiance to the Hot Antic Jazz Band and the Anachronic Jazz Band romping through AVALON: Michel Bastide, cornet; Daniel Huck, saxophone and ecstatic vocal; Jean-Francois Bonnel, my hero, on tenor saxophone; Bernard Antherieu, clarinet; Philippe Guignier, banjo; Partrice Aviet, string bass; Jeff Guyot, washboard. Not only are the solos delightful, but the riffs (listen, for instance, behind Antherieu) and the general ebullience . . . priceless. And my Facebook pals were having a serious debate the other day about their favorite male vocalist — may I ask that the name of DANIEL HUCK be inscribed in anyone’s list in capital letters? How do you say WOW! in French? Perfect and hilarious. Hilariously perfect. They remind me of the wise capers of the Anachronic Jazz Band . . . also the brilliant epigram: TIME DOESN’T EXIST. CLOCKS EXIST. In this case, the distance between an “Oriental fox-trot” circa 1925 and the “radical” “Chinese music” of Dizzy Gillespie twenty years later doesn’t exist: the two musics are one, and aren’t we glad? It was on May 12, 2012, in the village hall of Puget-sur-Durance, in the South of France, where this concert was organized by Michel Bastide (from the Hot Antic), Pierre Costantini and Mr.Sage, the mayor of this small village. Thanks to them. A “musical joke” worthy of Haydn and Mozart, and John Birks Gillespie is laughing appreciatively somewhere, I know. We salute Les Rois! All hail! Jazz has never quite shaken the notion that newer is better. Musician C, born in 1956, is an improvement on B, born in 1936, and we are affectionate about A, born in 1916, while casting kindly eyes at his shortcomings. And these assumptions creep into the critical language, as if playing a “harmonically sophisticated” chord was more “advanced” than a seventh. Perhaps this ideology has something to do with our desire for novelty, our short attention spans — listeners getting bored with perfection. Yes, artists do stand on the shoulders of previous generations — but such reasoning is ultimately limiting. As my counter-truth, I present four performances by the Anachronic Jazz Band, recorded at the Nice Jazz Festival on July 16, 1977. The AJB hasn’t existed since 1980, which is a pity: we always need such romping enlightenment. Its members were Patrick Artero, trumpet; Daniel Barda, trombone; Marc Richard, André Villéger, Daniel Huck, clarinet; Philippe Baudoin, piano; Patrick Diaz, banjo; Gérard Gervois, brass bass; Bernard Laye, drums. Goran Eriksson sits in on recorder on the third performance. The band’s comic spirit is witty and knowing; the music isn’t mean-spirited or broadly knockabout. You’ll see! Heartfelt evidence that “progress” in jazz is illusory; rather, art is a Mobius strip, where beginnings and endings cease to matter. ASK ME NOW would have gladdened the hearts of both Thelonious and Louis. Bless every one of them.